South Hill Designs Partners with Make-A-Wish Arizona and Make-A-Wish Canada! South Hill Designs has partnered with Make-A-Wish Arizona and Make-A-Wish Canada! South Hill Designs is donating 100% of the sales of our "Make A Wish" items! 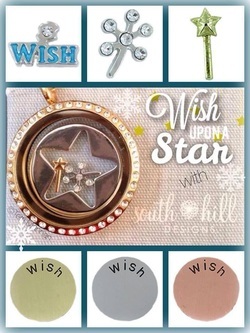 Items include: Star Screen (Gold, Rose Gold, and Silver), "Wish" Coin (Gold, Rose Gold, and Silver), Silver Shooting Star Charm, Gold Star Wand Charm, "Wish" Silver Charm. These can only be ordered through your South Hill Designs Artists, so email me at leanna.cutejewelry@gmail.com to order yours today! I can say, personally, that these are an amazing addition to any locket! I already have these items for my Glass Floating Locket, I love mixing them in with other charms, screens, and coins, or wearing them together and sharing with people how amazing South Hill Designs is! I was so happy to hear that out of all the charities, we chose Make-A-Wish. And we don't just donate a portion of sales, but 100%! Contact me today to order!